A lot of people are making resolutions and goals right now, and being motivated, but this article really spells out The Problem with Motivation. 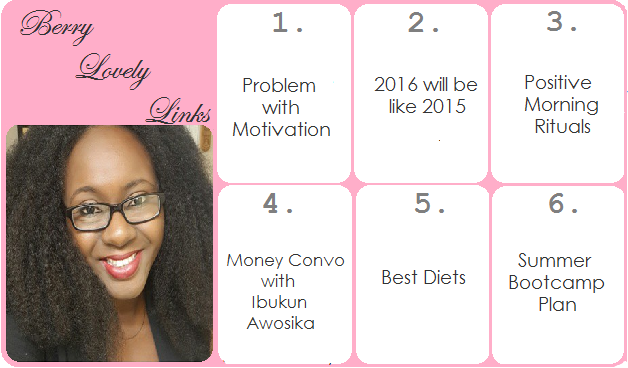 I like this blog post that says Why 2016 will be like 2015 for Most People. Setting Positive Morning Rituals should be at the top of your list this year. Arese Ugwu had a Money Conversation with Ibukun Awosika (she's the youngest person and first female to be the chairperson of First Bank, Nigeria). It's a long read but chockfull of wisdom. I know some people will want to lose weight this year. Check out US News Best Diets rankings. Speaking of losing weight, I like this Summer Bootcamp plan by Lauren Conrad. I read Arese's post, it's a must read, an amazing article. It was very insightful, wasn't it?